Along the two-lane backroad that connects the towns of Clements and Morganza in St. Mary’s County, Maryland, you will find "Ladybugs Alive! ", a field of a thousand suns—or sunflowers, rather. The flowers are planted in a large field across the street from Chopticon High School and are cleverly arranged in a maze-like pattern. From the air, the gaps between the sunflowers form the image of a cow leaping over a smiling crescent moon. But from the ground (especially from a child’s perspective) the field is a towering forest of green and yellow, buzzing and chirping with the sounds of life. I arrived at the maze around half past noon on Friday and parked my car (parking is free of charge). A red tent marked the entrance of the maze, where I was greeted with a warm welcome and a cold bottle of water. I paid the entrance fee (children 6 and under can enter for free, but for everyone else admission is $10) and grabbed a marker and a clipboard with a set of laminated sheets. The sheets listed local insects and birds likely to be found in the maze. Visitors can check off the species they find, like an ecological scavenger hunt. Just before the entrance, there was an aerial map of the entire maze attached to a post in the ground. I snapped a photo of it just in case, but I was determined to make it through the maze on my own. The shape of the sunflower maze appears unrecognizable from the ground, but a bird's eye view reveals the image of a cow jumping over the moon. When I crossed the threshold into the maze, I was immediately inundated with the sweet fragrance of so many sunflowers (more than fifteen thousand) crammed into a single field. As I progressed through what I guessed was one of the cow’s hind legs, the sunflowers rose in height, the tallest of them leaning perilously over my head like yellow street lanterns. Outside the maze, I was a taller-than-average person—but in here, I was a pipsqueak, the tiny mammal scurrying well below the heads of thousands of ten-foot-tall sentinels. The noise within the maze is difficult to gauge before entering, but inside it can only be described as a symphony. Honeybees dot the brown disks of the sunflowers with black and yellow stripes, gently humming as they search for nectar. Grasshoppers lie in disguise on the footpath until a visitor startles them into flurries of green and black. As I stepped around a fallen flower, a drowsy bumblebee ricocheted off my shoulder and buzzed away slightly annoyed. In hindsight, I probably should have avoided wearing a salmon-colored shirt with yellow Bermuda shorts to a sunflower maze. Resident bees had been feeding on nothing but sunflowers for days, and if the first reddish object that crossed their path was not a delectable echinacea, but a button-up from Old Navy, I’d be pretty irked too. The bees and the grasshoppers were fascinating, but as a kid, I had always been intrigued by butterflies. The swallowtails were easy to spot in the maze. 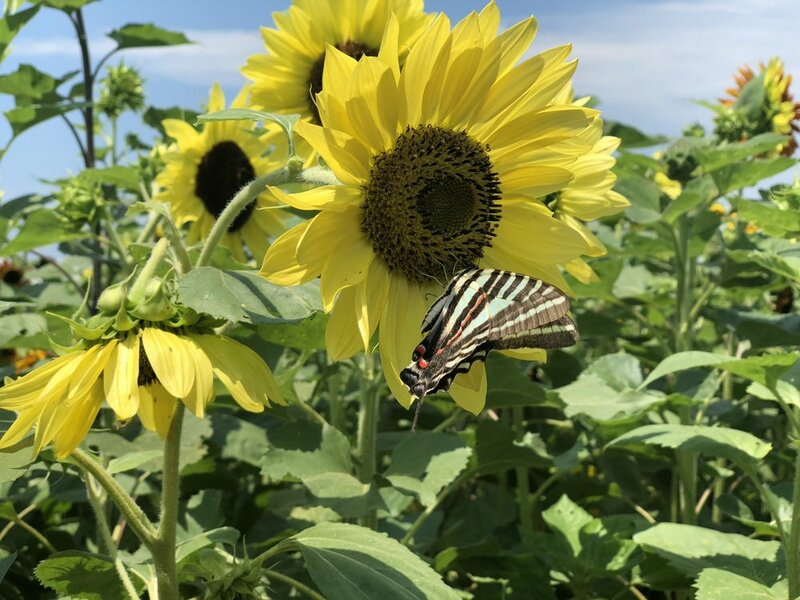 Their bright yellow wings stood out against the dark heads of the sunflowers. The cabbage whites stayed low to the ground and practically glowed in the midday sunlight. I checked off both species with my marker. Ladybugs Alive! offers a sunflower maze, a petting zoo and other activities for visitors young and old. I was coming around the cow’s lower jaw when I spotted it: a flash of orange and black, just inside my peripheral vision. Could it be? I turned around and backtracked to follow the orange blur, crossing into the cow’s front left hoof. It crested over a path of sunflowers, then reversed and flew south towards the moon’s outer crescent. I made several turns trying to catch another glimpse of what I suspected might be a monarch, that increasingly rare butterfly with vibrant orange and black wings and gentle white dots on its thorax. But in my fervent chase, I lost whatever tenuous sense of direction I had, and was now wandering cluelessly among the flowers. After encountering several dead ends, I came across a group of three high school students taking selfies with the sunflowers. (The maze is an excellent photo-op for the Instagram-inclined.) They seemed to know their way around the maze pretty well, and when they saw the aimless expression in my eyes, they offered to help lead me to the exit. Gratefully accepting their offer, I'd like to point out that technically, I didn't use the map to solve the maze. Technically. Just before exiting the maze, I spotted it again: that orange blur in the corner of my eye. The blur alighted on a nearby sunflower for a precious moment, just long enough to confirm that it was indeed a monarch, and not a similar copycat species as I had feared when I first caught a glimpse of it. A second later, the butterfly was borne aloft by a rare cool wind and vanished. "Ladybugs Alive!" can be found at 25120 Colton Point Road, Morganza, Maryland. The maze is open Sunday through Thursday from 10:00 AM to 8:30 PM, and Friday and Saturday from 10:00 AM to 10:00 PM. Admission is free for children 6 and under, and $10 for ages 7+. Tickets for daycare and school groups are just $5 per child and $10 per adult chaperone, and there is a 20%-off military discount. There is also a small petting zoo and craft activities for younger visitors to enjoy. Evening visits may feature unique critters such as moths and lightning bugs that are not found during the day. Their website is https://www.designeragllc.com/.